It's EZ ROUTING Front-panel routing access allows you to keep up with track assignments easily, which speeds up and reduces errors in the patching routine. Routing is accessed by a row of Select buttons assigned to the actual inputs and another row of Track buttons linked to the 16 internal Record tracks (each track consists of 16 virtual tracks, or V-Tracks). By holding down a given Select button, any track already assigned to that input will light up or can be activated by a button push. The reverse is also true-holding a Track button will light up any input (Select) patched to that track. 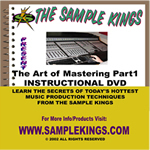 In this DVD we show you just how to do it, first we go to the back and set it up with our system and always make sure your volume level is down so you don't blow our system. Then we go to the front to explain every button, knob, dial, jog wheel, fader and input to give you an idea of how the operating system works. 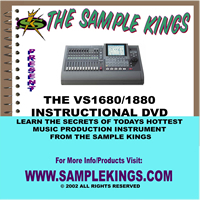 The 1680 can do a lot and we need to teach all of it so watch and take notes or just rewind. We like the EZ routing, the EZ Routing feature allows you to save templates of Select/Track assignments. Since effects and EQ are also available to the input channels, it is possible to create complex input maps for, say, a whole drum kit, complete with level, EQ and compression settings that can be recalled later. I even record vocals and record a track from my MPC using the EZ routing system. Audio can be broken up into Phrases and then moved, copied or pasted with the use of Markers, providing MIDI-style editing without using additional disk space. A whole song can be copied to another time location and edited into a new arrangement, complete with any necessary synchronization offsets to maintain sync. To ORDER with YOUR CREDIT CARD ONLINE Click here.